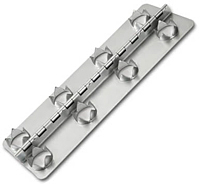 Heavy duty hinges are made of various hinge styles used in heavy duty applications. These material thicknesses range up to ¼” (one quarter inch) thickness. Overlay hinges fold into each other. Two hinge leaves that fold or lay into one another to reduce overall thickness. 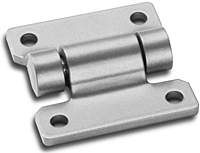 Special Hinges are any style of hinge manufactured to a customer’s specific needs or requirements. 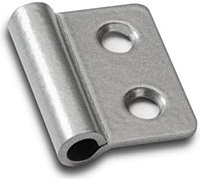 Stop hinges are commonly manufactured as either an inside stop hinge or an outside stop hinge at various degrees or angles. A swage hinge is designed to close the gap between the leaves in the closed position. Reverse swaging is used to simulate reverse assembly cost effectively. This type of hinge is shaped like the letter T. It is commonly used on gates. T hinges come in many different styles. T Hinges typically have one narrow leaf and one wide leaf. Weld hinges or weld-on hinges come in various styles of hinges that welding performed as a secondary process performed to it. 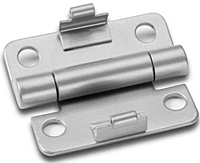 Are you looking for Types of Hinges?